Recently I was invited to Inspire a group of Doctors from Indira Gandhi Dental College in Pondicherry. At first I was shocked because I have not handled a session for Doctors in my entire life. 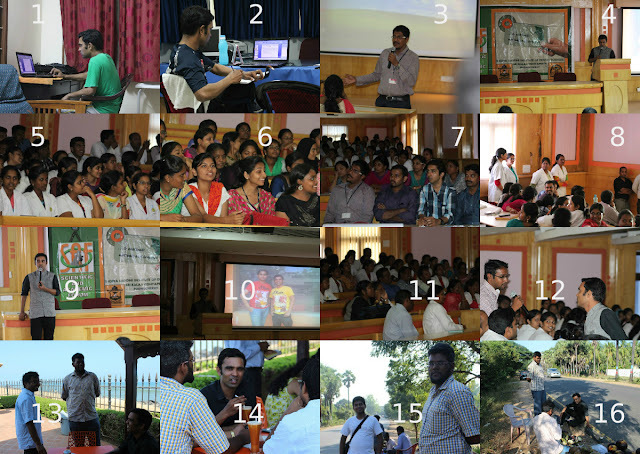 I usually handle sessions for MBA colleges, Engineering colleges and IT professionals. I still wanted to take the challenge and test those waters. The topic I suggested was "Magic Potion of an Influencer". Being an engineer with an MBA degree and doing a job that has nothing to do with my engineering degree nor my MBA (full time writer) has taught me to take up unexplored territories and this talk was the first of its kind. Thanks to my brother John Joshua who captured pictures from this talk, I am able to blog about this. 2) This photo was taken in the HOD - Dr. Manohar's cabin as soon as I landed in their college on 20th morning. I started at 5 am from Chennai and after the 3 hour drive, I was almost dozing off. 3) That is Dr. Manohar who was kind enough to invite a crazy guy like me to speak to doctors in the college. 4) When I went to the podium, I also realized that most of the students were asked to come for the talk amidst their college sports day celebrations. Imagine having a talk on a Saturday morning and that too when you have your sports day. I knew that I had to put up my best show to keep them active and not end up cursing me. 5) A portion of the audience at the beginning of the talk. They were awake. I spoke on four points " Leadership traits, technology for doctors, Team fit and Work-Life balance". 7) 30 minutes into the talk and they have not slept yet. This was half way through my talk and all this while I was talking in a very serious tone. My alter ego was playing within me and was forcing me to turn this into a standup comedy stage; but I kept my serious tone intact. 8) Just when I realized that they needed some action, some of the doctors were pulled up to play a game on "team fit". I guess they had fun. 16) Finally parked my bum on the road to feel the heat. It was hot and the hot road left his tar on my pants. Did I influence the college students? You should ask them because I seriously have no clue. Juice ah ? Costly aana speaker ah irupeenga pola ..